We want you to have the information you need to help in your minister endeavors. Our ministry does not charge membership fees, ordinations are 100% free and granted for life. 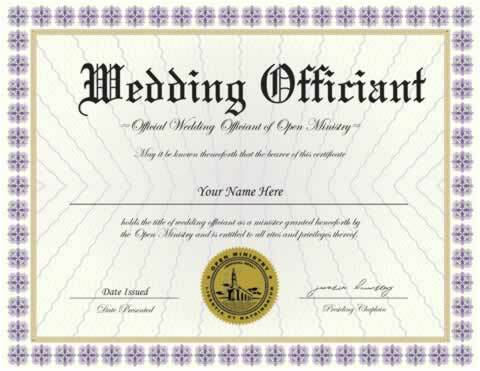 Your official credentials are proof of your ordination and status as a minister in good standing, they are not state specific and are valid in all US states. 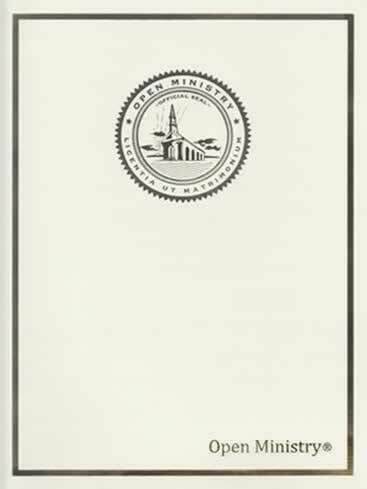 Request hard copies through our bookstore at: https://www.oministry.com/credentials. Marriage laws vary per state and county, it is important to be familiarized and know the ministerial requirements set forth by your state and local government. States may require official documentation to register with the county clerk or agency that records marriages in the county you want to perform ceremonies. Contact the county clerk or agency that will be issuing the couple’s marriage license for information. 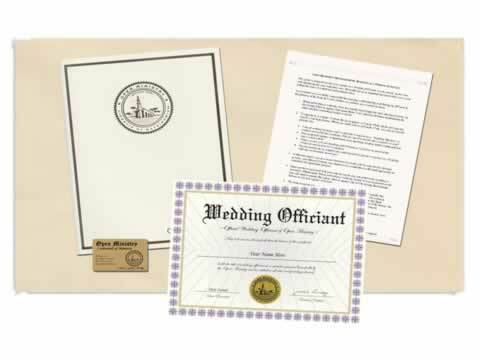 See our Marriage Laws for details at: https://www.oministry.com/ordained-marriage-laws. We are pleased to offer you our services; we appreciate your support of Open Ministry. If you have questions after reading our Minister Guide, visit our FAQ section. Please contact us directly if you would like additional information. his package was everything I needed. As I already had the booklet. Thank you! The materials I received from Open Ministry were key in helping me to provide a lovely, personal and spiritually based service for each of the wedding couples. The various approaches and verbiage provided was outstanding, and gave me additional ideas of how to make the wedding ceremony special. A very good package and professional quality materials! Thank you! I think the packet should have included a little more that is needed when performing a wedding, especially if its your first time. I'm looking forward to all I can do with being ordained. I found this package to be very helpful to me when planning for the wedding I performed. I would highly recommend! This group is fantastic. They are so customer oriented and efficient. I would highly recommend them to anyone. The package was very professionally done. I appreciated the guidelines a lot, and the certificate to give to the bride and groom was very special to them. If I am lucky enough to be asked to do this again, I will be purchasing this package for the next wedding, for sure. Thank you for making this a special event in my life and the lives of my friends.